We are Northern Virginia’s premier winery tour operator, sharing the experience of DC’s Wine Country with residents around the metro area since 2002! Every weekend we travel to 2 award-winning Virginia wineries on our weekend public trips, and we offer the option to customize your own private tour as well. 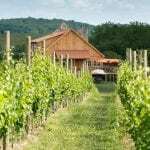 Want to experience DC’s Wine Country with family or friends a public Virginia winery tour? Fill out the form below for a chance to win 4 seats on your choice of any of our public weekend Wine tours! Entries close at noon on Friday Sept. 30.